Here it is, Genesis. All natural butter with Avocado, Meadow oil, Green tea and Lemongrass. Blended to perfection for a full sensation that surpasses all expectations. All natural Avocado body butters. Avocado Tree generally grows in sub-tropical regions. Our butter is hydrogenated to yield a green-tinted butter that is soft and has a very mild odor. The butter is solid at room temperature but has wonderful melting properties which make it ideal for skin care. Also blending, Meadowfoam Oil - Pressed from the seeds of a Pacific Northwest native annual, Limananthes alba. Containing over 98% long-chain fatty acids, Meadowfoam Oil is one of the most stable oils with the ability to extend shelf life of less stable ingredients. Use in your handmade recipes for its moisturizing and rejuvenating properties. This oil has a non-greasy feeling, blends well with other carrier oils and has binding qualities, allowing it to help your products retain scents longer. Adding Green Tea Extract: The benefits of Green Tea are well known from an ingestion standpoint. Green Tea has natural antioxidants (called catechins) that help fight damage caused by free radicals. Animal studies have showed protection from skin cancer. Both animal and human studies have demonstrated that topical green tea formulations reduce sun damage. Very preliminary studies show that green tea topically may inhibit enzymes whose excessive activity contributes to age-related degradation of the skin matrix. We are finishing with a touch of lemongrass. This all natural body butter will take back the years!! Natural Body Butters are the best(YES). 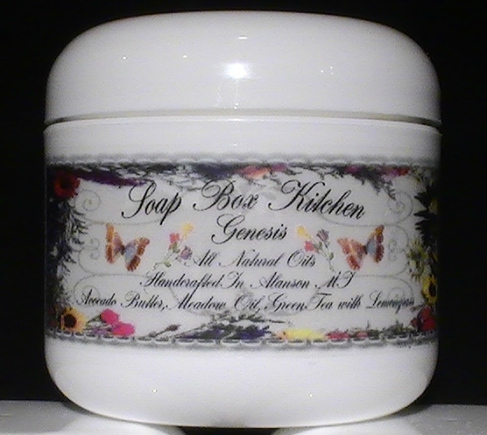 Body Butters are high above a simple moisturizing lotion. Body butter should contain natural butters and oils, made without chemicals contained in most store moisturizers. Body butter shouldn't contain any water, preservatives or colors, therefore making them thicker and better then most brands in the stores today, and lasting longer with all the benefits. all first time users. Body butter is created light, luxurious and feels heavenly. Body butter can be used anywhere on the body, including face, hands, feet and anywhere you wish to have smooth silky skin. use a base butter of Avocado, which is high in vitamins and mineral content, known to benefit dry skin. Our Body butter is whipped and made with natural oils and essential oils so they're light and easily applied. No colors are used which can stain clothes. A properly made butter that hasn't been overly processed will have a consistency of cream cheese frosting and should absorb completely in 5 to 15 minutes, depending on how much one uses. a remarkably high level of oxidative stability. Meadow Seed Oil is one of the most stable triglycerides known. Meadow Seed Oil provides good emollience with out being overly greasy. Meadow Seed Oil absorbs quickly and leaves a lighter feel then other oils. Essential oils used in body butter will provide a pure and natural scent, which other manufactured scents have chemical undertones. Making body butters with essential oils have additional benefits for health, wellness, and medicinal properties. Next time you buy skin care products please take in consideration of the love that Soap Box kitchen uses in there process and recipes for there customers.